SPW033588 SCOTLAND (1930). 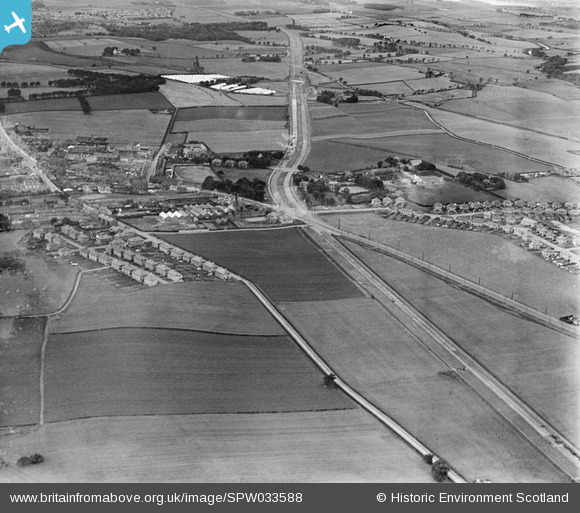 The A8 Glasgow and Edinburgh Road, Baillieston, Glasgow. An oblique aerial photograph taken facing north-west. Title [SPW033588] The A8 Glasgow and Edinburgh Road, Baillieston, Glasgow. An oblique aerial photograph taken facing north-west. Site of P&S (Contracts) Baillieston, Glasgow. This company ran three big MACK 'King of the Road' trucks in the late 60s/early 70s (see pic). The Crown Inn. Camp Road/ Buchanan Street, Baillieston. This old public house in Camp Road, Baillieston used to sit on the site of Saint Bridget's School. No. 15 tramcar from Airdrie passing Rhinsdale Church, Main Street on it's way to Garrowhill terminus. Site of 'Charlie's Roundabout, Thornbridge Road. Charlie was Charlie Mitchell who owned the right most shop in the picture. It was a newsagents. He was formerly a sargent in the police based in Baillieston station, Shotts and Hamilton before that. He lived in Bannercross Drive. His wife was Jean. Charlie passed away in about 1974 and Jean in 87 i think. They were my grandparents. Gillies Lane. These houses were built c1840. They are still standing. St Bridget's Church, built 1893. Baillieston Bowling Club. Est 1912. Baillieston parish church. St. Andrews only applies to the replacement church built in the early 1970s. What are the works going on to the north of the bowling club?